Next Workshop dates are September 16th – October 21st, 2018 ! 6 Sundays: September 16th – October 21st, 2018, from 10:00 am-1 p.m. 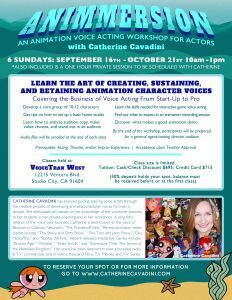 This is an intensive course covering everything an actor needs to know to dive into a career of animation and interactive game voice acting. Designed to assist experienced and professional actors in building their vocal repertoire of characters, the goal of the class is for each actor to develop at least 10-12 distinct voices by the end of the workshop. During the course, actors will expand their stable of characters as they acquire the material, tools, and knowledge they will need to eventually create a successful animation demo and career. Prior voice acting experience is not required but prior acting experience is a prerequisite due to the amount of information that is covered and the accelerated pace of the class. Acceptance is upon teacher approval. Rather than giving lectures, I believe in the somatic approach – that you need to do it and embody it, in order to learn it. My top priority is that all of my students get as much recorded mic time in the booth as possible. For this reason, I implement a flipped classroom style where discussion material is emailed ahead of time and read prior to class. Some discussion and answering of questions will be included but the main emphasis during the class is one on one coaching while recording in the booth. 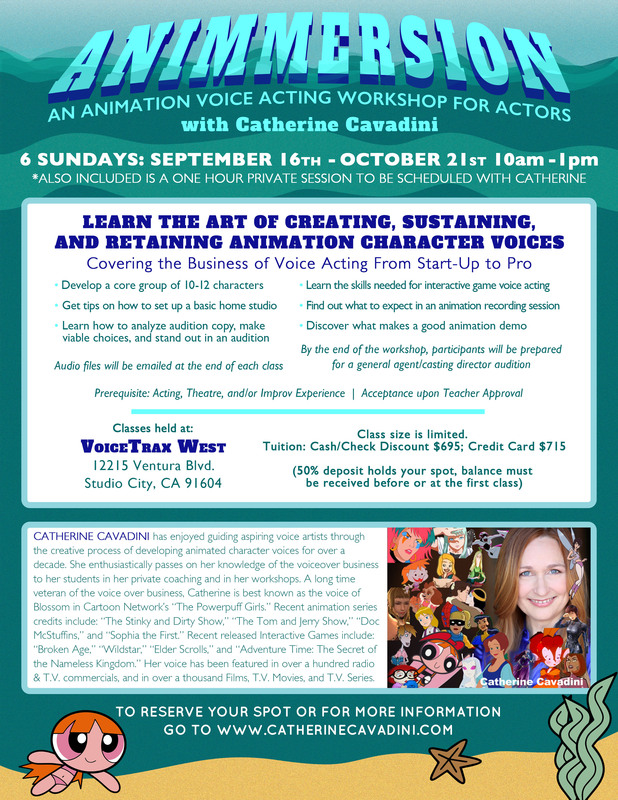 Each day of the workshop will focus on a particular aspect of the animation voice over business. For example, one of the sessions will be dedicated to interactive game voice acting covering the unique skills and challenges associated with that genre. Another session will be set aside for group recordings of scenes from a variety of animated tv shows and movies. Recording the group scripts in the studio will give the actors a true experience of what an ensemble cast recording is like. The course culminates with a simulated general audition where the actor will perform 10-12 characters back to back in front of the class. Most students will be prepared to perform a general audition in front of an agent or casting director directly after this experience. After the class is over, some students choose to take the next workshop or continue studying privately with me in preparation to make their demos. There will be homework assigned each week. I work individually with each student and carefully select scripts that will show off and develop their talent. Students who want to gain the most out of the workshop should plan on taking the class at a time when their schedules allow time for extra work outside of class. I strive to create a fun, supportive atmosphere in my workshops. It truly brings me joy when my students begin to truly “get it” and I love hearing about their successes after the class is over. If you have any questions, have any problems with the registration form, haven’t received a response within a day or two, or would like more information, please read the attached flyer and/or fill out a contact form on this website.